^ Mishkin, Sarah. Foxconn profits beat expectations. Financial Times. 2013-11-13. ^ msn 台灣｜Windows 10, Windows app 應用程式, Microsoft Store 商城, hotmail, outlook, skype, 即時新聞. www.msn.com. ^ 「プレイステーション 4」世界累計実売9,160万台を突破 『Marvel's Spider-Man』は累計実売900万本超え - PlayStation.Blog. 「プレイステーション 4」世界累計実売9,160万台を突破 『Marvel's Spider-Man』は累計実売900万本超え - PlayStation.Blog. ^ PlayStation 4 - VGChartz. www.vgchartz.com. ^ Goldfarb, Andrew. PlayStation 4 Revealed. IGN (Ziff Davis). 2013-02-20 [2013-02-21]. （原始内容存档于2013-02-24）. ^ 10.0 10.1 PlayStation 3 sells out at launch. BBC News Online. 2006-11-11 [2013-02-22]. （原始内容存档于2007-01-08）. ^ Minkley, Johnny. Sony: it would be "undesirable" for PS4 to launch significantly later than the competition. Eurogamer (Eurogamer Network). 2011-11-23 [2013-02-21]. （原始内容存档于2011-11-25）. ^ 索尼与IBM合作开发PS4处理器 性能达PS3两倍. 新浪游戏频道. 2011-06-01. ^ 硬件规划彻底失败 PS4将放弃Cell架构. 新浪游戏频道. 2012-03-01. ^ Sony Computer Entertainment 於美国纽约的PlayStation Meeting 2013 正式发表次世代电脑娱乐主机 「PlayStation®4」兼具强大演算能力、融合社群功能、并可迅速存取内容 在此为各位介绍该主机开发中的部分精采游戏。. 索尼电脑娱乐（亚洲）. 2013-02-21. ^ PS4国行发售宣布延期 或与“不锁区”有关. 新浪科技. 2015-01-09. ^ EVERYTHING ANNOUNCED AT SEPTEMBER 7'S PLAYSTATION MEETING.IGN.2016-09-07.[2016-09-09]. ^ 4 NEW PS4 PERIPHERALS ANNOUNCED.IGN.2016-09-08.[2016-09-09]. ^ Hearn, Mark. PlayStation 4 will not have native PS3 backwards compatibility. 2013-02-20 [2013-02-25]. ^ 22.0 22.1 Taylor, John. AMD and The Sony PS4. Allow Me To Elaborate.. AMD. 2013-02-21 [2013-02-25]. （原始内容存档于2013-05-26）. ^ Shimpi, Anand Lal. AMD’s Jaguar Architecture: The CPU Powering Xbox One, PlayStation 4, Kabini & Temash. AnandTech. 2013-05-23 [2013-11-09]. （原始内容存档于2013-12-11）. ^ 24.0 24.1 24.2 24.3 24.4 24.5 24.6 24.7 24.8 24.9 SONY COMPUTER ENTERTAINMENT INC. INTRODUCES PLAYSTATION®4 (PS4™) (新闻稿). Sony Computer Entertainment. 2013-02-21 [2013-02-25]. （原始内容存档于2013-04-24）. ^ Sinha, Ravi. PlayStation 4 FCC Filing Reveals 2.75 GHz Max Clock Speed Frequency. GamingBolt. 2013-07-16 [2013-09-12]. （原始内容存档于2013-08-26）. ^ Santos, Alexis. Sony PlayStation 4 waltzes past the FCC. Engadget. AOL. 2013-07-22 [2013-09-11]. （原始内容存档于2013-07-25）. ^ Femmel, Kevin. Sony reveals the PS4: New controller, 8GB RAM, doesn’t play PS3 discs and more. Gimme Gimme Games. 2013-02-20 [2013-02-21]. （原始内容存档于2013-03-16）. ^ Yin-Poole, Wesley. PS4: PC-like architecture, 8GB RAM delight developers. Eurogamer (Eurogamer Network). 2013-02-22 [2013-02-25]. （原始内容存档于2013-03-02）. ^ 29.0 29.1 29.2 29.3 Leadbetter, Richard. Spec Analysis: PlayStation 4. Eurogamer. Eurogamer Network. 2013-02-21 [2013-02-25]. （原始内容存档于2013-04-19）. ^ Conditt, Jessica. PS4 allows playing games as they're downloading. Joystiq (AOL). 2013-02-20 [2013-02-24]. （原始内容存档于2013-02-21）. ^ Williams, Mike. Articles Register Sony reveals developer-centric PlayStation 4. Joystiq (AOL). 2013-02-20 [2013-02-24]. （原始内容存档于2013-04-19）. ^ Seifert, Dan. Sony PlayStation 4 games can be played while they are downloading. The Verge (Vox Media). 2013-02-20 [2013-02-24]. （原始内容存档于2013-04-18）. ^ 33.0 33.1 Inside the PlayStation 4 With Mark Cerny. Gamasutra. [2013-06-08]. （原始内容存档于2013-06-15）. ^ Kuchera, Ben. Is Blu-ray really a good medium for games?. Ars Technica. Condé Nast Publications. 2007-01-17 [2013-02-25]. （原始内容存档于2012-12-01）. ^ Fletcher, JC. PS4 will output video in 4K, but not games. Joystiq (AOL). 2013-02-21 [2013-02-21]. （原始内容存档于2013-05-21）. ^ Alexa Ray Corriea. PS4 will support 4K for 'personal contents' like photos, but not games. Polygon (Vox Media). 2013-02-21 [2013-02-21]. （原始内容存档于2013-06-01）. ^ PlayStation 4 (PS4) Design and Price Unveiled, Available at $399 in U.S. and at €399 in Europe (PDF) (新闻稿). Sony Computer Entertainment. 2013-06-11 [2013-06-11]. （原始内容 (PDF)存档于2013-06-13）. ^ Sony's PlayStation 4 Eye is a $59 add-on, PS4 packs an upgradable 500GB HDD inside. Engadget. AOL. 2013-06-10 [2013-06-10]. （原始内容存档于2013-09-02）. ^ 39.0 39.1 PlayStation4，硬盘更换操作. 之乎. 简书. 2017-04-30 [2017-05-06]. ^ 40.00 40.01 40.02 40.03 40.04 40.05 40.06 40.07 40.08 40.09 40.10 40.11 40.12 40.13 SONY COMPUTER ENTERTAINMENT INTRODUCES WIRELESS CONTROLLER FOR PLAYSTATION®4 (DUALSHOCK®4) AND PLAYSTATION®4 EYE (新闻稿). Sony Computer Entertainment. 2013-02-21 [2013-02-26]. （原始内容存档于2013-04-13）. ^ Grant Brunner. Sony issues correction: PS4 will not support analog output [Updated]. ExtremeTech (Ziff Davis). 2013-06-18 [2013-06-20]. （原始内容存档于2013-06-24）. ^ PS4 System Software Update 1.50. PlayStation Blog. Sony Computer Entertainment. 2013-10-25 [2013-10-28]. （原始内容存档于2013-10-26）. ^ Spencer. Jump Back Into A Game With PlayStation 4's Suspend Mode, No Save Point Necessary. Siliconera. 2013-02-20 [2013-09-13]. （原始内容存档于2013-06-16）. ^ 44.0 44.1 Pearson, Rob. 20 things you didn’t know about PS4. PlayStation Blog. Sony Computer Entertainment. 2013-07-12 [2013-07-12]. （原始内容存档于2013-07-13）. ^ PlayStation 4 iFixit Teardown. [2014-01-17]. ^ 48.0 48.1 48.2 48.3 48.4 MacManus, Christopher. Finer details about PlayStation 4's DualShock 4 controller, Eye camera. CNET. CBS Interactive. 2013-02-21 [2013-02-21]. （原始内容存档于2013-05-30）. ^ 49.0 49.1 PLAYSTATION®4 (PS4™) DESIGN AND PRICE UNVEILED (PDF) (新闻稿). Sony Computer Entertainment. [2013-06-11]. （原始内容 (PDF)存档于2013-06-13）. ^ PlayStation 4 Controller is PC-Compatible 'for Basic Functions'. Kotaku. Kotaku. [2013-10-06]. （原始内容存档于2013-12-11）. ^ 51.0 51.1 51.2 51.3 McWhertor, Michael. 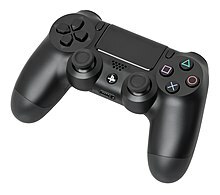 PS4 touch-sensitive DualShock 4 controller revealed (update: features, scale detailed). Polygon. Vox Media. 2013-01-31 [2013-02-21]. （原始内容存档于2013-02-23）. ^ Gilbert, Ben. The PlayStation 4 supports the PlayStation Move controller. Engadget. AOL. 2013-02-20 [2013-02-21]. （原始内容存档于2013-02-21）. ^ 53.0 53.1 Kyle MacGregor. PlayStation 4 Eye: Applications of PS4's twin cameras. Destructoid. 2013-02-21 [2013-02-21]. （原始内容存档于2013-04-09）. ^ Scullion, Chris. Eye spy: Has Sony found its answer to Kinect?. Computer and Video Games. Future plc. 2013-02-21 [2013-02-21]. （原始内容存档于2013-05-30）. ^ Buckley, Sean. PS4 Eye promises to unlock your PlayStation at a glance, tips hat to Kinect. Engadget. AOL. 2013-02-20 [2013-02-21]. （原始内容存档于2013-02-21）. ^ Conditt, Jessica. PS4 Eye has two cameras: One to watch you, one to make you pretty. Joystiq. AOL. [2013-02-21]. （原始内容存档于2013-05-08）. ^ Larabel, Michael. Sony's PlayStation 4 Is Running Modified FreeBSD 9. Phoronix. 2013-06-23 [2013-09-14]. （原始内容存档于2013-06-24）. ^ Humphries, Matthew. PS4 runs modified version of the FreeBSD 9.0 operating system. Geek.com. 2013-06-24. ^ Open Source Software used in PlayStation®4. Scei.co.jp. [2014-01-02]. ^ Hurley, Leon. Michael Denny on PS4's philosophy. Official PlayStation Magazine (Future plc). 2013-03-20 [2013-06-01]. （原始内容存档于2013-06-01）. ^ Jackson, Mike. Gaikai tech brings spectating, instant demos, more to PS4. Computer and Video Games (Future plc). 2013-02-20 [2013-02-25]. （原始内容存档于2013-05-09）. ^ How to Share Used PlayStation 4 Games. IGN. Ziff Davis. [2013-06-11]. （原始内容存档于2013-06-15）. ^ PS4: publishers decide if free-to-play multiplayer requires PS Plus. VG247. 2013-06-13 [2014-01-02]. ^ Nelva, Giuseppe. E3 2013: Sony’s Shuhei Yoshida Shares Relevant Details on PlayStation Plus Requirement for Multiplayer on PS4. DualShockers. 2013-06-12 [2013-06-12]. （原始内容存档于2013-06-15）. ^ Nutt, Christian. Further clarification on Sony's DRM policies: No more online pass. Gamasutra. 2013-06-11 [2013-06-12]. （原始内容存档于2013-08-12）. ^ 66.0 66.1 66.2 Bramwell, Tom. The big interview: Sony's Shuhei Yoshida on PS4. Eurogamer (Eurogamer Network). 2013-02-21 [2013-02-25]. （原始内容存档于2013-04-19）. ^ Post-launch PS4 update to add MP3, DLNA support. Computer and Video Games. Future plc. [2013-11-20]. （原始内容存档于2013-11-13）. ^ June, Laura. Sony completely revamps its user interface for the PlayStation 4. The Verge (Vox Media). 2013-02-20 [2013-02-21]. （原始内容存档于2013-04-11）. ^ Stuart, Keith. PS4: 14 things we learned at Develop 2013. The Guardian. Guardian Media Group. 2013-07-15 [2013-07-16]. （原始内容存档于2013-07-17）. ^ Shah, Niraj. PlayStation 4 will support trophies. XTreme PS3. 2013-02-22 [2013-02-22]. （原始内容存档于2013-04-12）. ^ Dyer, Mitch. Netflix, Amazon Instant, More Coming to PlayStation 4. IGN (Ziff Davis). 2013-02-20 [2013-09-09]. （原始内容存档于2013-04-15）. ^ "13 Digital Entertainment Apps on PS4 at Launch". PlayStation.com. 7 November 2013. ^ "Sony details 11 PS4 entertainment apps available at launch, includes the ones you want". Engadget.com. ^ "Sony names apps available for US PS4 launch". MCV The Market For Computer & Video Games. 8 November 2013. ^ JOYSOUND DIVE 2（仮）. PlayStation.jp. Sony Computer Entertainment Japan. [2014-04-11]. ^ Orland, Kyle. 17 things we learned from Sony’s massive PS4 FAQ. Ars Technica. 2013-10-31 [2013-12-12]. ^ Ngak, Chenda. Sony announces PlayStation 4, DualShock 4 controller. CBS News. 2013-02-20 [2013-02-22]. （原始内容存档于2013-02-21）. ^ Karmali, Luke. PS4 Responsible For 10 Percent of All Twitch Streaming. IGN. 2013-12-10 [2013-12-10]. （原始内容存档于2013-12-10）. ^ PS4ゲームプレイ動画をニコニコ生放送で配信可能に 2014年春から. INTERNET Watch (インプレス). 2014-02-14 [2014-03-01]. ^ Twitch Confirmed for PlayStation 4. Twitch. 2013-08-20 [2013-09-14]. ^ Smith, Mat. The PS4 won't be region-locked. Engadget. AOL. 2013-09-14 [2013-06-11]. （原始内容存档于2013-06-15）. ^ George, Richard. E3 2013: PlayStation 4 Supports Used Games, Doesn't Require Online Connection. IGN (Ziff Davis). 2013-06-11 [2013-06-11]. （原始内容存档于2013-06-15）. ^ Grubb, Jeffrey. Sony will allow indie devs to publish their own games on PlayStation 4. VentureBeat. 2013-06-10 [2013-06-13]. （原始内容存档于2013-08-23）. ^ Carmichael, Stephanie. Sony reveals its powerhouse of indie games on PlayStation 4. VentureBeat. 2013-06-10 [2013-06-10]. （原始内容存档于2013-06-15）. ^ Prescott, Shaun. Sony: every PS4 title will be available as digital download. Computer and Video Games. Future plc. [2013-02-25]. （原始内容存档于2013-05-28）. ^ The PS3's Biggest Complaint Breeds The PS4's Strengths. GamerXChange. 2013-05-30 [2013-05-30]. （原始内容存档于2013-03-24）. ^ Hurley, Leon. PS4's digital library lets you play your games anywhere & on anyone's console. Official PlayStation Magazine. Future plc. 2013-07-10 [2013-09-14]. （原始内容存档于2013-07-18）. ^ Bramwell, Tom. Sony tells Eurogamer: PlayStation 4 will not block used games. Eurogamer. Eurogamer Network. 2013-02-21 [2013-02-25]. （原始内容存档于2013-03-02）. ^ Kubba, Sinan. Sony: PS4 can play used games. Joystiq. AOL. [2013-02-21]. （原始内容存档于2013-05-30）. ^ Cerny, Mark. PS4′s PlayGo system explained by Sony’s Mark Cerny. VG247. 2013-04-24 [2013-06-01]. （原始内容存档于2013-06-15）. ^ Hearn, Mark. PlayStation 4 will not have native PS3 backwards compatibility. Engadget (AOL). 2013-02-20 [2013-02-25]. （原始内容存档于2013-02-21）. ^ Fletcher, JC. PlayStation 4 will stream PS1, PS2, PS3 games. Joystiq (AOL). 2013-02-20 [2013-02-25]. （原始内容存档于2013-04-25）. ^ Ishaan. PlayStation 4 Won’t Play PlayStation 3 Games Natively, Coming This Holiday. Siliconera. 2013-02-20 [2013-02-20]. （原始内容存档于2013-05-21）. ^ PlayStation 2 Emulation Coming to PS4, Sony Confirms. 2015-11-19. ^ 星新极. PS4国行版国服解锁教程：新2.50系统资料备份还原的妙用. A9VG. 2015-03-28 [2015-04-08]. ^ 真的有那么简单吗？国行ps4解锁教程. 泡泡网. 2015-04-07 [2015-04-08]. ^ Robinson, Andy. Interview: 'We're more Epic than we've ever been'. Computer and Video Games. Future plc. 2013-04-02 [2013-09-14]. （原始内容存档于2013-07-02）. ^ Lynch, David. PS4: 'Sony Made Wise Choices' - Carmack. Nowgamer. Imagine Publishing. 2013-02-21 [2013-09-14]. （原始内容存档于2013-07-02）. ^ Yin-Poole, Wesley. PC-like architecture, 8GB RAM delight developers. Eurogamer. Eurogamer Network. 2013-02-22 [2013-09-14]. （原始内容存档于2013-03-02）. ^ Top Developers React To PlayStation 4. Game Informer. GameStop Corporation. [2013-05-20]. （原始内容存档于2013-06-15）. ^ Moriarty, Colin. In Brazil, PlayStation 4 will cost over $1,800. IGN. 2013-10-17 [2013-10-17]. ^ Sarkar, Samit. PlayStation 4 to cost more than 1,800 USD in Brazil. polygon.com. 2013-10-17 [2013-10-17]. ^ Makuch, Eddie. PS4 costs $1,850 in Brazil. Gamespot. 2013-10-17 [2013-10-17]. ^ Stanley, Mark. GAMERS BRASILEIROS, NÓS OUVIMOS VOCÊS. blog.br.playstation.com. 2013-10-21 [2013-10-21]. （原始内容存档于2013-10-21） （葡萄牙语）. ^ Gaston, Martin. Sony says Brazil's $1,850 PlayStation 4 price "is not good for the PlayStation brand". Gamespot. 2013-10-22 [2013-10-22]. ^ Sherr, Ian. Sony Says PlayStation 4 Launches Nov. 15. Wall Street Journal. Dow Jones & Company. 2013-08-20 [2013-08-23]. （原始内容存档于2013-08-20）. ^ Goldfarb, Andrew. Sony sold 1 million PS4 consoles in 24 hours. IGN. Ziff Davis. 2013-11-17 [2013-11-17]. （原始内容存档于2013-11-17）. ^ PS4 beats Xbox One to become UK's fastest ever selling console. The Independent. 2013-12-02 [2013-12-02]. （原始内容存档于2013-12-03）. ^ PS4 outsold Xbox One by 166,000 consoles in UK last year. 2014-01-01 [2014-01-01]. ^ House, Andrew. PS4 Global Sales Update. PlayStation Blog. Sony Computer Entertainment. 2013-12-03 [2013-12-03]. （原始内容存档于2013-12-10）. ^ Goldfarb, Andrew. CES: PlayStation 4 Sales Pass 4.2 Million. IGN. 2014-01-07 [2014-01-07]. ^ Byford, Sam. Sony has sold over 5.3 million PlayStation 4 consoles worldwide. The Verge. 2014-01-18 [2014-01-18]. ^ Natasha Lomas. Sony Beats Its PS4 Sales Target, With 5.3M Consoles Sold In 3-Months. TechCrunch. AOL Inc. 2014-01-18 [2014-01-18]. ^ PLAYSTATION®4 (PS4™)全球銷量突破2,020萬. 2015年3月4日 [2015-03-23]. ^ PlayStation.com (亞洲) - 台灣. asia.playstation.com. ^ SCEJAデピュティプレジデント織田博之氏特別インタビュー／アジアでのPS4ヒットの理由。アジア先行発売に「あり得ないことが起こった！」. GAME Watch. 2014-02-03 [2014-02-03]. ^ PS4のTV-CMが本日1月1日よりオンエア！ アメリカや欧州などに続いて今年はいよいよ日本で発売. 電撃. 2014-01-01 [2014-02-03]. ^ 124.0 124.1 索尼PS4正式入华 国行版售价2899元. 腾讯科技. 2014-12-11 [2014-12-11]. ^ 关于PlayStation®中国版产品延期上市的声明. 索尼电脑娱乐（上海）有限公司 weibo weixin. ^ 举报PS4不锁区的网民遭人肉 竟是任天堂粉丝. 新浪游戏. 2015-01-06. ^ PS4が現地時間11月15日に北米およびカナダで発売開始！. 電撃オンライン. 2013-11-15 [2013-12-15]. ^ Sony Confirms all 32 Countries the PS4 Will be Available in on November 15th/November 29th. playstationlifestyle.net. 2013-08-20 [2013-12-15]. ^ PS4 now available in 48 countries, Xbox One only in 13. gamespot.com. 2013-12-13 [2013-12-15]. ^ Tonight, a PlayStation Exec Was Moved to Tears. kotaku.com. 2013-12-17 [2013-12-17]. ^ 香港でPS4が発売開始！深夜のロンチイベントは大盛り上がり. inside-games.jp. 2013-12-17 [2013-12-17]. （原始内容存档于2013-12-20）. ^ 台湾でのローンチイベントの記事. eprice.com. 2013-12-18 [2013-12-19]. ^ PlayStation 4 launches in Singapore. channelnewsasia.com. 2013-12-19 [2013-12-19]. （原始内容存档于2013-12-19）. ^ Konsol Permainan Sony PlayStation 4 Mula Dijual Di Malaysia（タイトル和訳:マレーシアでソニーのゲーム機プレイステーション4販売開始）. amanz.my. 2013-12-20 [2013-12-20]. ^ ソニーのPS4、インドで来年1月販売開始…価格3万9990Rs. response.jp. 2013-12-30 [2014-01-11]. ^ PS4 Resmi Hadir di Indonesia, Dibanderol Rp 6,99 Juta（タイトル和訳:インドネシアでプレイステーション4が699万ルピアの価格で公式発表）. republika.co.id. 2014-01-10 [2014-01-10]. 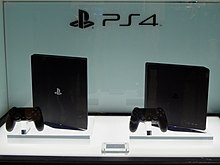 ^ 世界各国で続々とローンチされている「PlayStation 4」新たにタイとフィリピンで2014年1月14日に発売決定. gamespark.jp. 2013-12-13 [2014-01-19]. ^ ソニーＰＳ４、国内でも発売　ソフト充実、シェアで拡散. 朝日新聞デジタル (朝日新聞). 2014-02-22 [2014-02-22]. ^ PlayStation® 4和 PlayStation® Vita将于2015年3月20日在中国上市. 索尼电脑娱乐（上海）有限公司. 2015-03-10 [2015-03-10]. ^ PlayStation 4 Slim 港台发售资讯确定.engadget中文版.2016-09-08.[2016-09-11]. ^ PS4 Slim 正式发布，9 月 15 开卖.engadget中文版.2016-09-08.[2016-09-11]. ^ SONY INTERACTIVE ENTERTAINMENT TO LAUNCH SLIMMER AND LIGHTER PLAYSTATION®4 IN SEPTEMBER, AVAILABLE AT SGD449.Sony PlayStation Singapore.2016-09-08.[2016-09-11]. ^ SONY INTERACTIVE ENTERTAINMENT TO LAUNCH SLIMMER AND LIGHTER PLAYSTATION®4 IN MID-OCTOBER.Sony PlayStation Malaysia.2016-09-08. [2016-09-11].